The automobile industry has long been known to be one of the most aggressive when it comes to using 3D printing technology. In fact, car manufacturers were some of the very first businesses to utilize 3D printing in order to rapidly prototype various automobile parts and designs. This has been going on literally for decades, but in recent times, we have begun to see car manufacturers take the idea of 3D printing a few step further. There have been car parts which have been completely 3D printed, entire cars — in the case of Local Motors — that have been printed in plastic, and various other innovations going on within the automobile industry. 3D printing certainly has its place not only in current car manufacturing but in the future as well. Today, Ford Motor Company has informed 3DPrint.com that they are taking things to a whole new level when it comes to 3D printing. No, they aren’t 3D printing an entire car, nor are they allowing people to 3D print replacement parts, but what they are doing will certainly appeal to both fans of the company as well as car enthusiasts and collectors in general. Available to order models include the new Ford GT, F-150 Raptor, Shelby GT350R, Focus ST, and Fiesta ST with plenty more models coming in the very near future. These models are printed at 1:32 scale in plastic and are priced at $39.00. However, if you own a 3D printer yourself, or have access to one, you can purchase the 3D design files for a measly $4.99. This allows you to scale the car to whatever size you wish and print it out yourself. 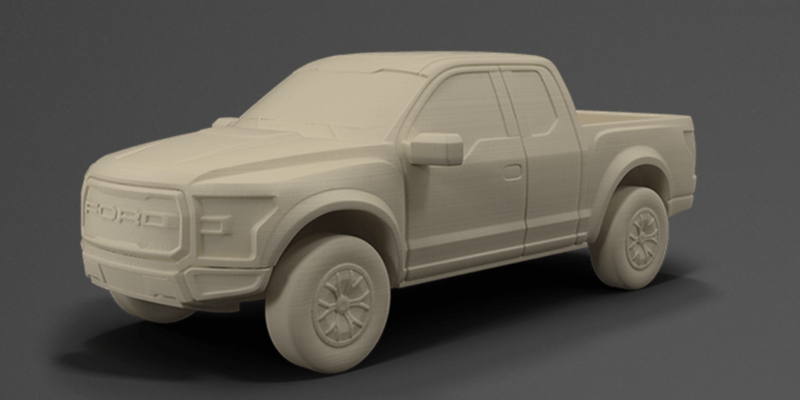 So what exactly spurred Ford into making these incredibly detailed and accurate replicas available to 3D print? Seemingly it is the fact that researchers are predicting that sales of desktop 3D printers will exceed 1 million units within the next 3 years, over twenty times the number sold last year. 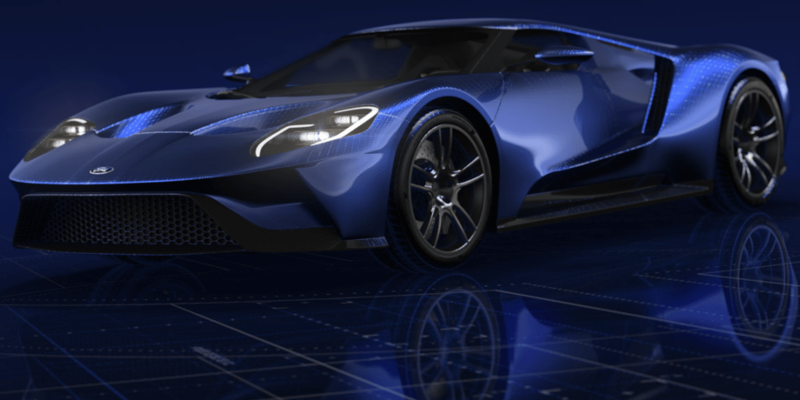 The Ford 3D Store website has been built by Turbosquid, a company that specializes in selling 3D models and stock images. They have extensive experience when it comes to selling similar models which are capable of being 3D printed, so they have a clear understanding of IP laws and various methods of securing files. When users purchase a 3D model, they must agree not to distribute it elsewhere. This has the potential of bringing up an issue which certainly has been looming for the 3D printing space for the past few years. It should be interesting to see how companies like Ford and Turbosquid ultimately deal with such IP conflicts that may arise if people begin to freely share these files, without providing Ford with any royalties. Without a doubt, this is huge news for the 3D printing space. The idea that individuals can now purchase 3D printed models of licensed replicas, or the design files for these vehicles and then print them out themselves, is something that no other car manufacturer has yet to do. 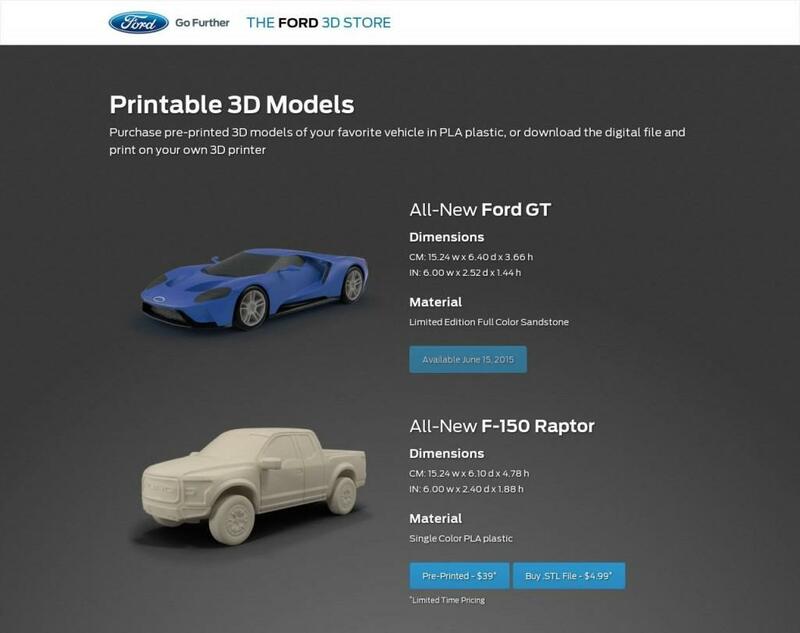 It should be interesting to see how well this business model works, and we will certainly be keeping an eye out for future models which are released to the Ford 3D Store. What do you think about this announcement? 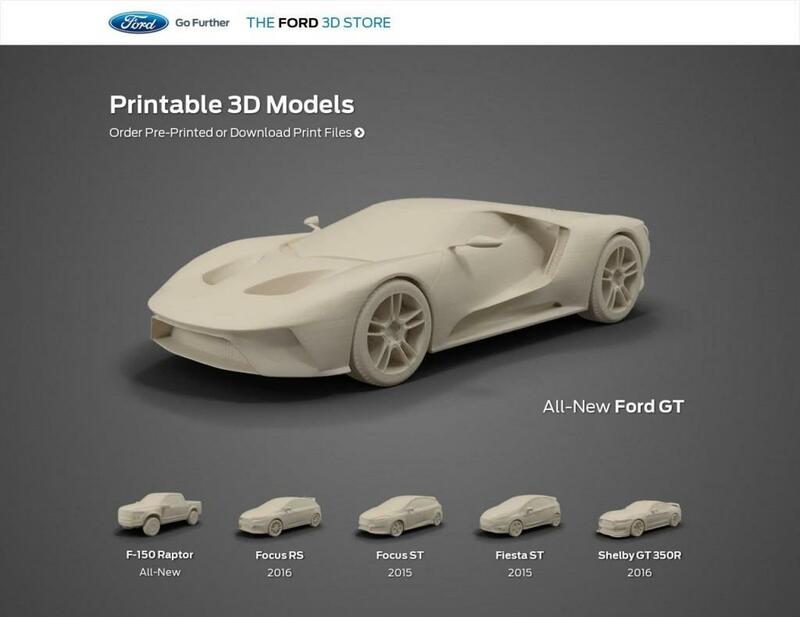 Will you be downloading and printing your own Ford vehicles anytime soon? Should other car manufacturers contemplate doing the same thing as Ford has? Discuss in the Ford 3D Store forum thread on 3DPB.com.